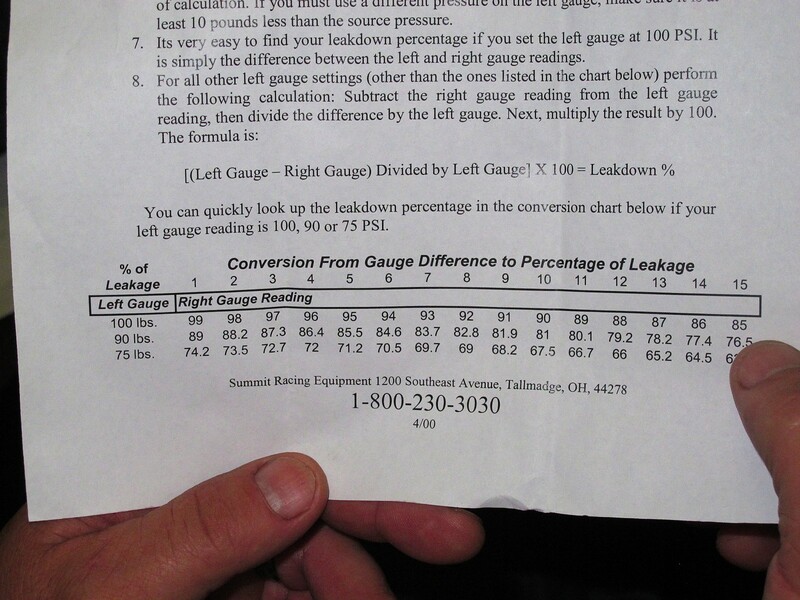 Using a leakdown tester is one of the best ways to assess the health of your engine. 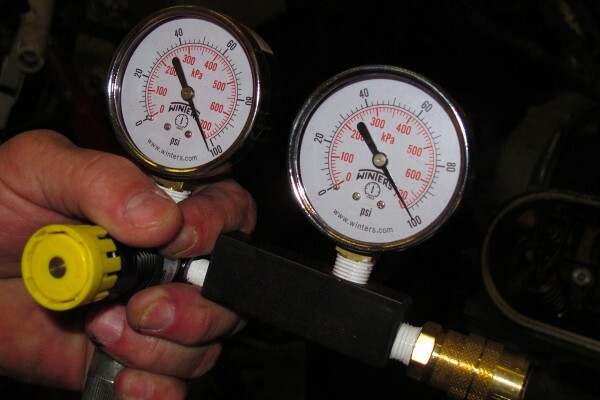 Easy to use, a leakdown tester measures how much cylinder pressure is escaping from your cylinders, showing how efficiently your piston rings and valves are sealing the combustion chamber, along with your head gasket. 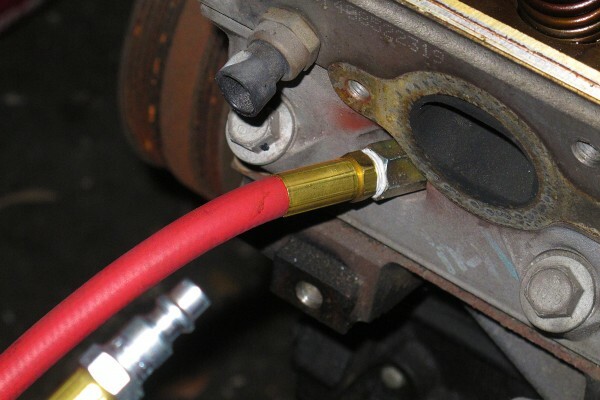 With street engines, ten to twenty percent leakdown is typically acceptable. For race engines, the acceptable leakdown is one to ten percent. 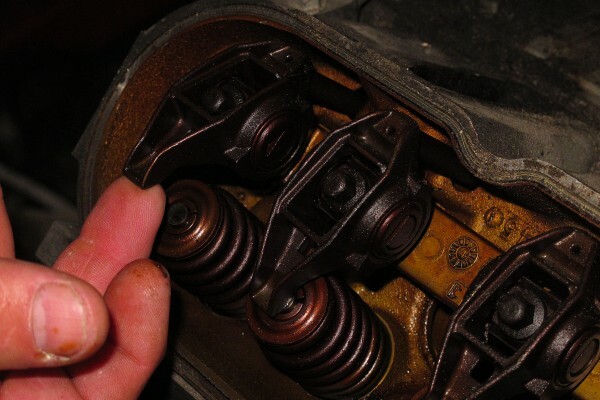 If you have one or more cylinders that have out of spec leakage, this points to a problem with sealing in the engine and usually requires disassembly to properly diagnose and repair. 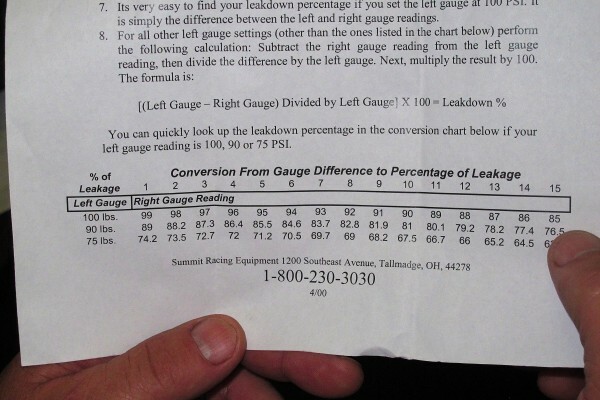 If you’ve just built a motor, doing a baseline leakdown test before it has run is ideal, so you can track your engine’s performance and wear over time. The first step is to bring the cylinder you’re testing to top dead center. 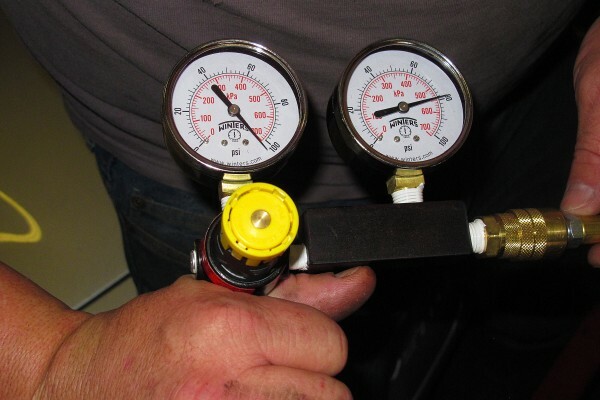 This minimizes the risk the engine will rotate when air pressure fills the cylinder. 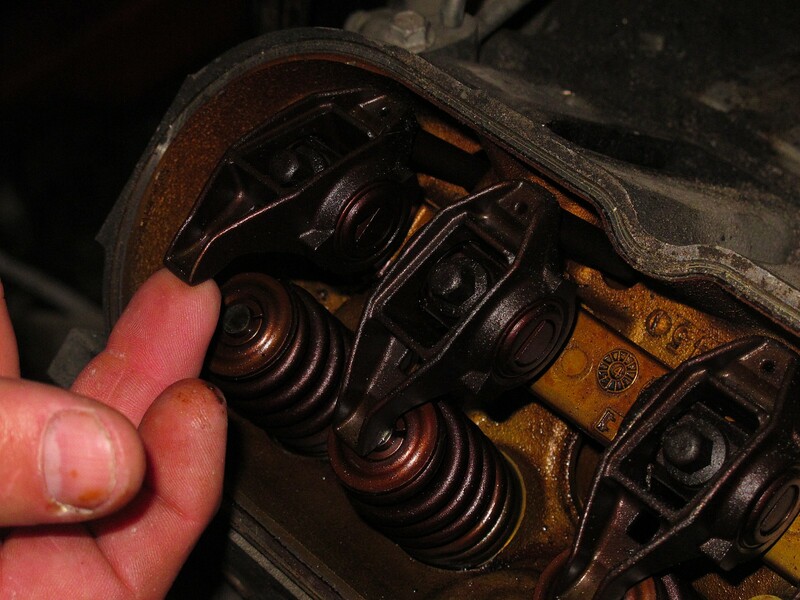 Next, loosen the adjuster nuts on the intake and exhaust rocker arms for that cylinder, to ensure the valves are fully closed. 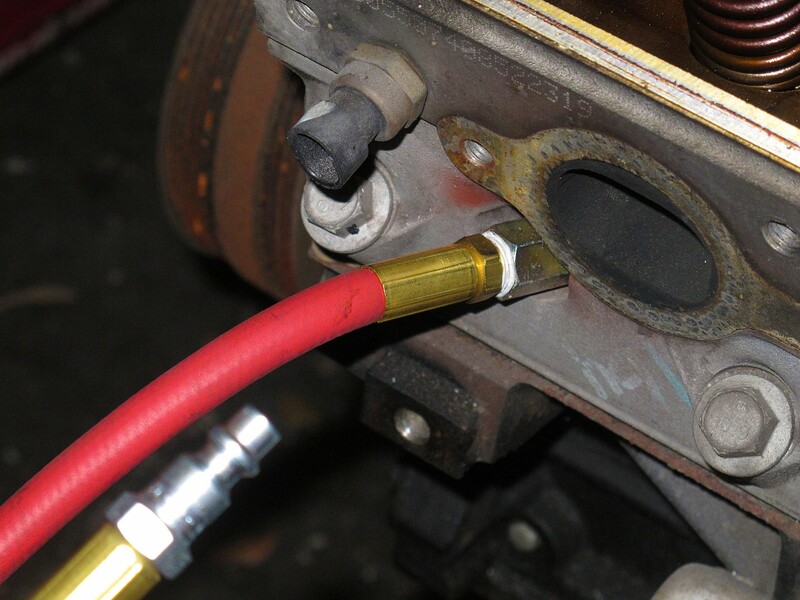 Thread the fitting into the spark plug hole, and make sure it’s tightened down. It helps to wet the o-ring on the fitting to aid in sealing. 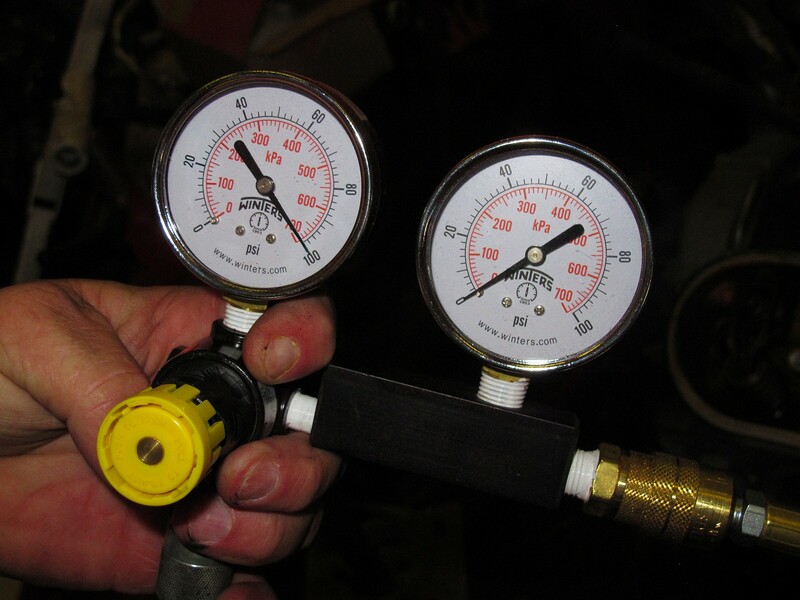 The gauge on the left reads the pressure of the constant air supply. 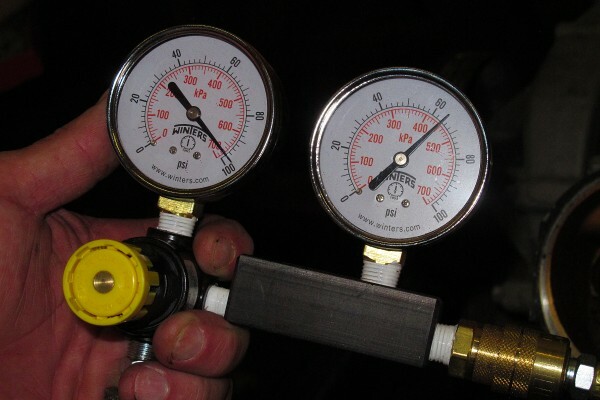 The gauge on the right reads the leakdown of pressure in the cylinder. 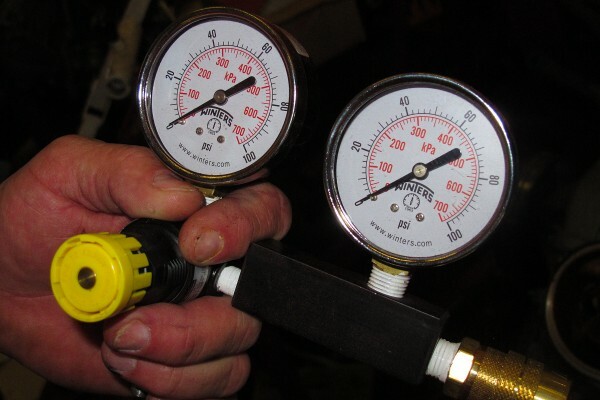 Before hooking up the air supply, both gauges should read zero. If they don’t, you won’t get an accurate reading. 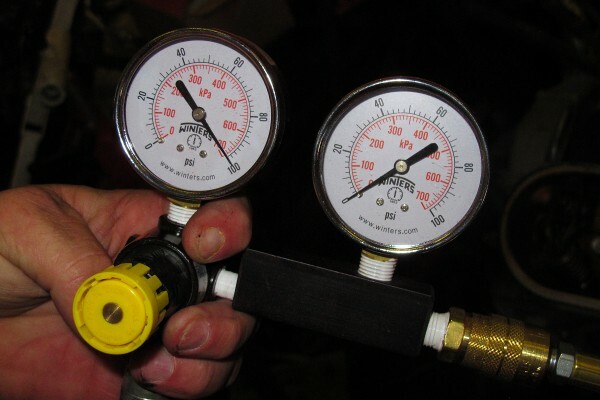 To use the leakdown tester, you’ll need an air compressor with an air tank. 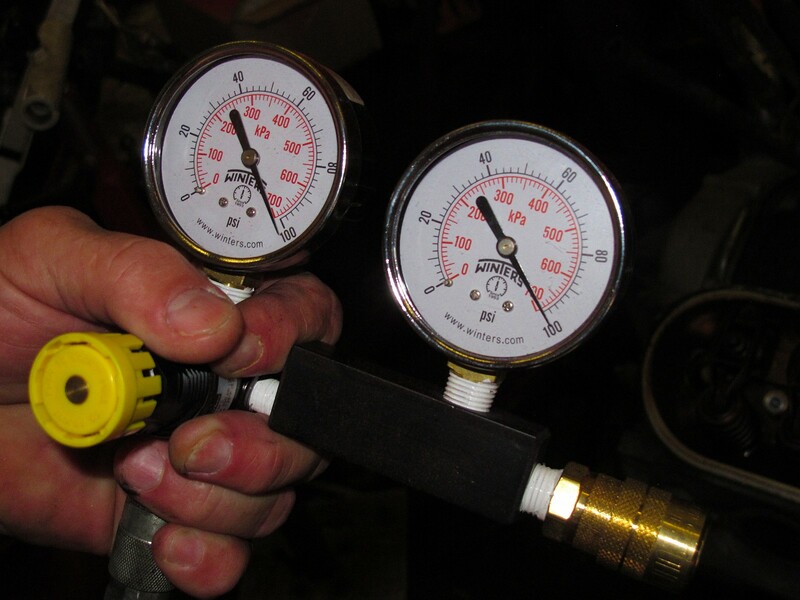 Plug the air line into the tester, then use the yellow adjustment knob to change the airflow till the needle on the left gauge is on 100. 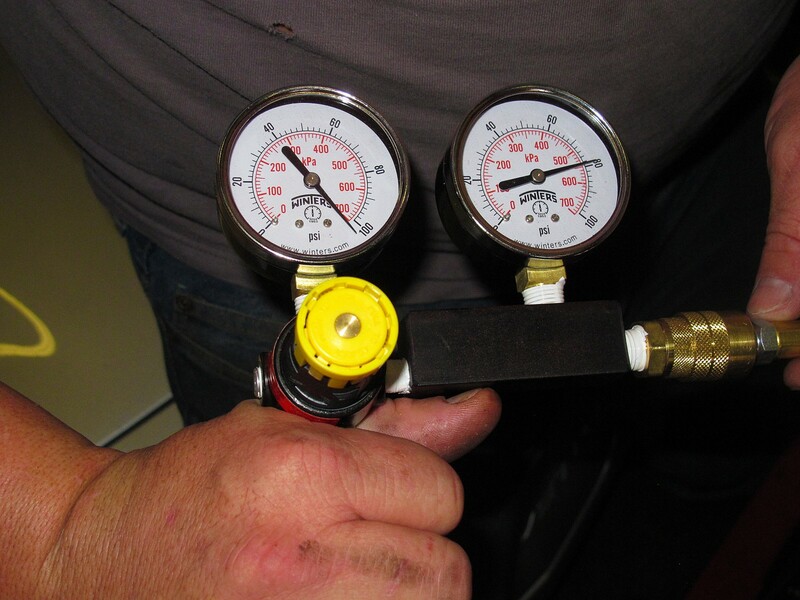 With the air line going into the engine hooked to the tester, the gauge will read zero until you hook the hose into the engine. 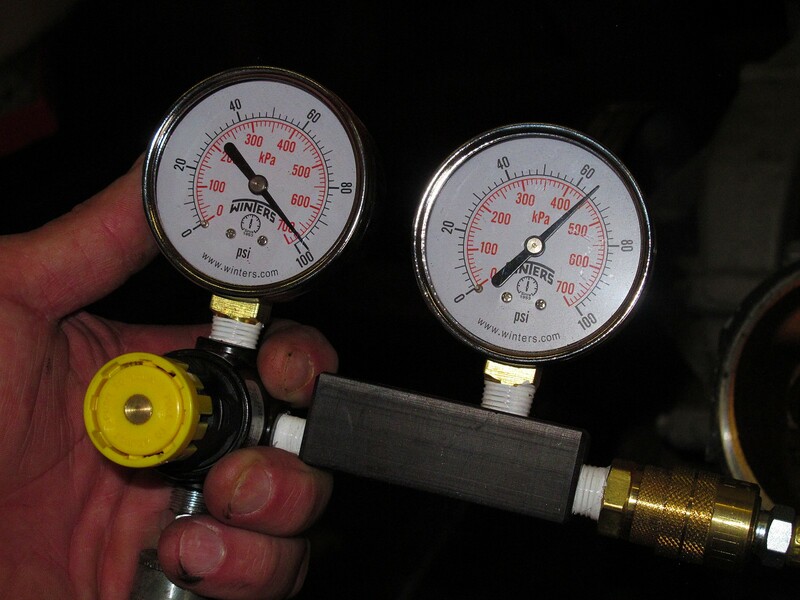 Once the hose from the tester to the engine is in place, the gauge will start to climb. The first engine we tried the gauge on, the gauge went to 64 psi, meaning we had 36 psi of leakage from the cylinder we tested. This is out of spec for most engines (typically a new engine will have about three to ten percent leakdown, and normally worn engine about 20 percent) and means the 6.0L truck motor we used first needs a rebuild. The next engine we tried was a 4.8L GM truck motor with about 170k miles on it. 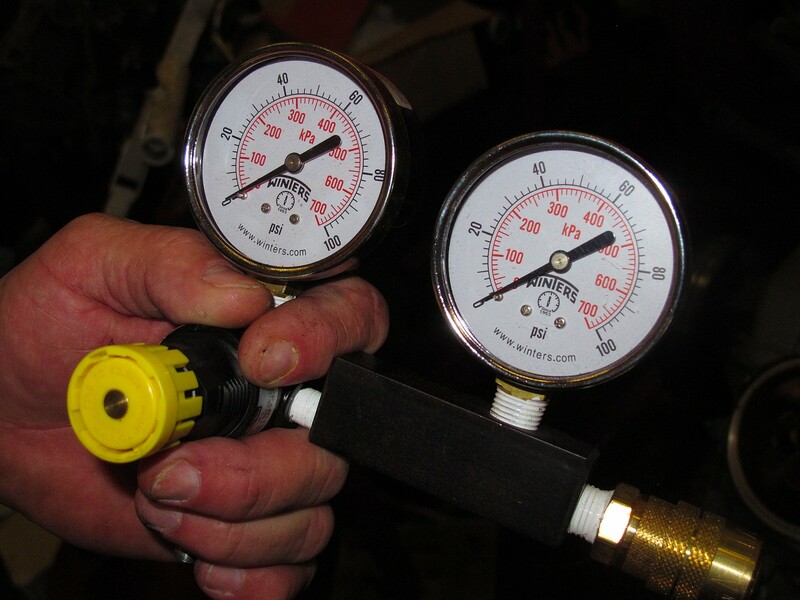 For this test, the gauge went to 89 psi, meaning the 4.8 only had 11 psi of leakdown, well within normal spec. I have been using a lead down tester all my life in the aircraft industry. You failed to say that with air going into the cylinder the engine will try to turn over. 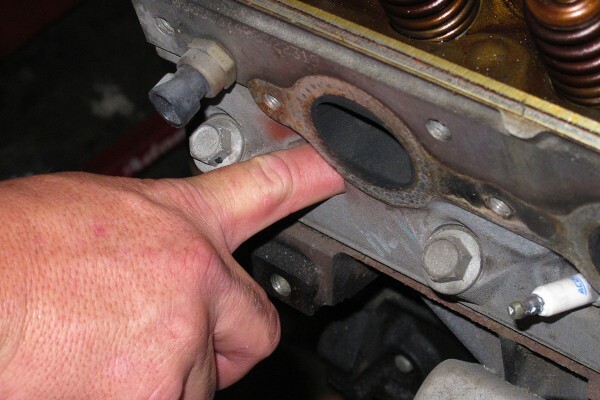 You need to hold the crankshaft in place to take a reading also you can rock the crank to bring the pressure reading up a little, just make sure you return it to tdc for the reading. 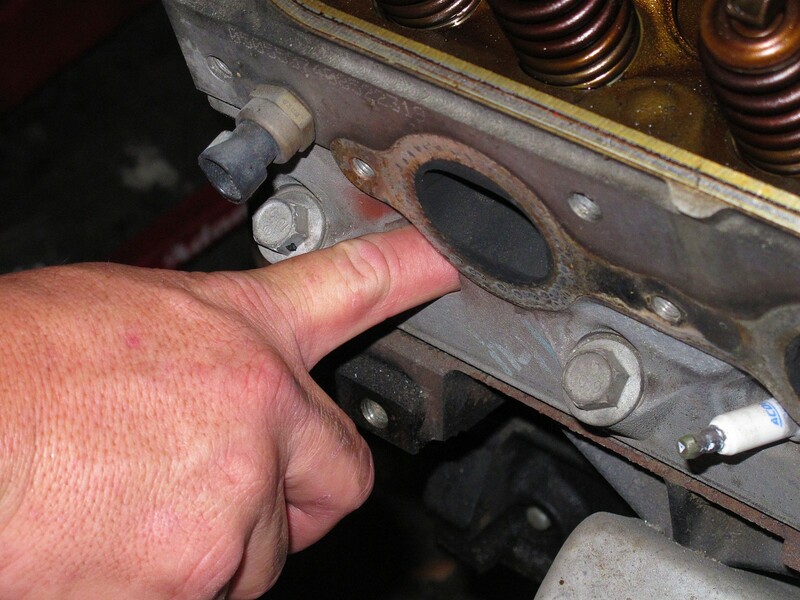 Listening at the intake, exhaust and case or block breather will tell you where the problem is. Old school technology coming around that the auto industry!